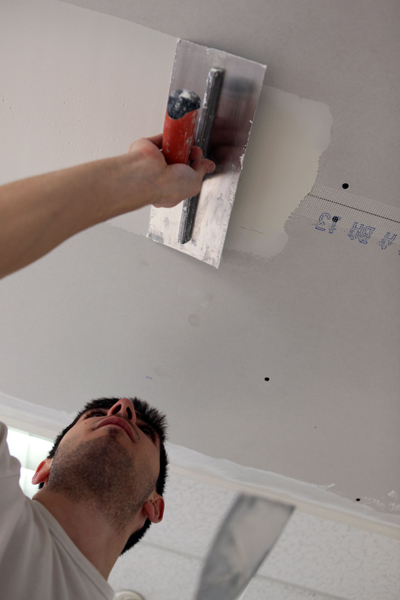 When you need help, our professional service team is able to safely repair your drywall ceiling. “Drywall Repair in Azusa” has everything we need to handle the job of repairing your drywall ceiling. Our service team has gone through the proper training and has the qualification to help you. You may not realize it but that small stain you’ve been noticing may be spreading to other parts of your ceiling. This means that it may be possible that you’ll need the entire ceiling repaired. If this were the case, it would be best to take care of the problem at the same time. We know how to correctly deal with and repair the problem regardless of how big or small it is. If you are trying to sell a home, this is something that could potentially stop interested buyers from buying your home. * Vertical- This crack starts in your ceiling and will run down your wall. This could be caused by a foundation issue. * Spiderweb- It gives the appearance of a spider web and can actually start from the floor or the walls of your home. * Sagging- You may notice part of your ceiling slightly sagging. This is caused by a problem in your foundation. One common cause of cracked ceilings is the foundation. There are, however, other factors that may contribute to the problem you are experiencing. With the help of our expert team, we are sure that we will be able to properly identify why you are having this problem and resolve it so that you do not have to worry about it reoccurring. For any of your drywall needs, contact us today.